After the release of the fantastic Break album in 1998 it was pretty quite. 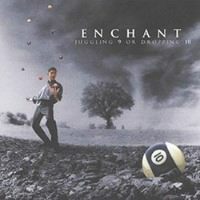 No news from Enchant. There were questions like... Is the band still existing? Will there be another release? Will it be on the same high quality level? Many questions unanswered. But now with their latest release Juggling 9 Or Dropping 10 (What a title? What does it mean to them?) this questions can finally be answered. First and most obvious, the band is still existing. Actually a some band members had a side-project called Xen, but now they are 100% back and their latest album with 12 tracks is in the stores.